San Francisco Bay Area, California April, 1998 Considered one of the best natural harbors in the world, San Francisco Bay, with its various sediment patterns, can be seen in this unique near-vertical view. Surrounded by the San Francisco Metropolitan area to the west and southwest, the Berkeley and Oakland Metropolitan area to the east, and the San Jose Metropolitan (not visible on the image) to the southeast, San Francisco Bay is 50 miles (80 km) long and from 3 to 13 miles (5 to 21 km) wide. Waters of the Pacific Ocean (bottom of image) enter the bay through Golden Gate, a strait between two peninsulas. The world famous Golden Gate Bridge is discernible on the image connecting the two peninsulas. The bay is as deep as 100 feet (30 meters) in spots, with a channel 50 feet (15 meters) deep maintained through the sand bar off Golden Gate. The major transportation routes in all metropolitan areas are visible on this image. Also discernible is the San Mateo Bridge near the right center of the image. Just to the left of the center of the image is Treasure Island, an artificial island covering 400 acres (162 hectares). It was constructed as a site of the Golden Gate International Exposition (1939-1940) and became a United States Naval Base in 1941. The small white objects in the bay and entering the golden gate are ships. New York State (below) - Elevation data used in this image was acquired by the Shuttle Radar Topography Mission (SRTM) aboard the Space Shuttle Endeavour, in 2000. From Lake Ontario and the St. Lawrence River (at the top of the image) and extending to Long Island (at the bottom), this perspective view shows the varied topography of eastern New York State and parts of Massachusetts, Connecticut, Pennsylvania, New Jersey and Rhode Island. The high 'bumpy' area in the upper right is the southern and western Adirondack Mountains, a deeply eroded landscape that includes the oldest rocks in the eastern United States. On the left side are the Catskill Mountains, a part of the Appalachian Mountain chain, where river erosion has produced an intricate pattern of valleys. Between the Adirondacks and Catskills, a wide valley contains the Mohawk River and the Erie Canal. The Hudson River runs along a straight valley from right center (near Glens Falls), widening out as it approaches New York City at the lower left on the image (NASA). Travel and Tourist Guide and Maps - United States, Canada. 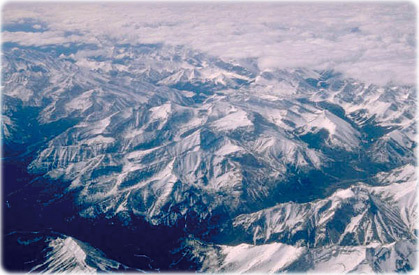 Aerial view of part of the Canadian Rockies.